It's been a ranty few weeks for me, if you follow me on twitter that is! It's also been a while since I turned to this space as my opportunity to expand upon the 140 character limit. But here I am, writing this before work starts, with my latte in my hand thinking 'where do I begin'!! Now, if UKPSFW wanted to show that style was indeed sizeless, then why not engage with the vast number of wonderful plus size bloggers (including the US names which joined the FROW) to create a number big statement? My sister in body politics Sharon, has blogged about this in more detail here. 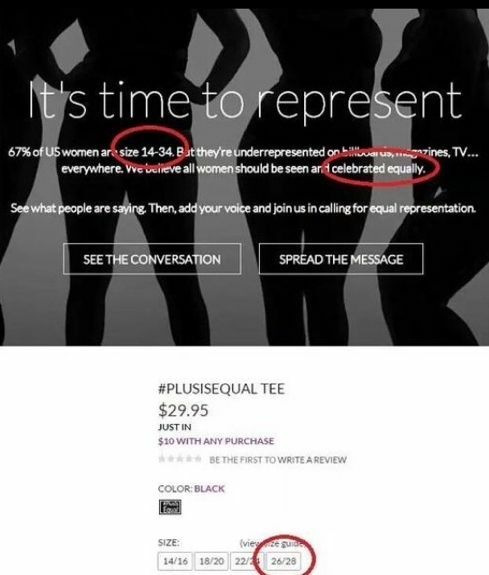 And after the dust settled on that battle ground, the team behind Lane Bryant (a very expensive plus size fashion brand in the US) started with their campaign, questionably called #plusisequal. Now, first off, to what? To each other? To straight sized fashion? What Lane Bryant, WHAT? The lets look at the models chosen to represent this rally cry, shall we? According to this then, #plusisequal to curves, hour glass figures, with a flat stomach, and Amazonian in stature. The 'pretty' end of the plus size spectrum, if you will. Okay, so they're professional models, and you don't get many models signed to an agency that are outside of the 'normative' fats. But again, use bloggers, use smaller model agencies. In the UK, we have the UGLY model agency - which caters for those who don't want the standard model. Therefore 'it's model standards' is no longer a good enough answer when looking at a campaign who is trying to show that plus size bodies matter. But I might have given then the benefit of the doubt, hey, they're trying right? Lane Bryant also brought out a tee shirt, to allow the general population to show that they support this body positive (sic) campaign. Erm... The people who are meant to be empowered by this, end up being marginalised. Again. Like we're not marginalised enough. With it being a US campaign, I wasn't expecting much interaction or commentary - the joy of twitter is throwing the tweets out there and watching to see if it makes any ripples in the water! The #ifpluswasequal tag was filled with examples and reasons that the campaign was exclusionary (which Sharon also covers very well here) - not venting at the brand, but taking their anger to a place when it was phrased around educating why it was problematic, instead of just shouting it from the rooftops. I know prominent bloggers were asked to take part in the rally in Times Square, or join in with selfies in London, and that's okay - but we also need to listen to the criticism, and listen to our inner voices that whisper "I've a very bad feeling about this" - and which Virgy covers in her article here. Don't judge us for getting involved - but judge us if we don't throw the critical view on the situation. Now, if you're a brand, and you've read all this and thought - HOW CAN I DO THIS RIGHT?! Take a look at Murder of Goth's post here. In summary, I'm not sure if brands have a place in body politics - I think they can support existing campaigns, existing hashtags - but if you're setting up your own in order to drive traffic to your site, or for people to pay over the odds for a statement tshirt: you have no place in the political arena. I'm so glad more people are speaking out about this and not just accepting their lot. We CAN do better. We DESERVE better. really interesting post, so many people should have know better!